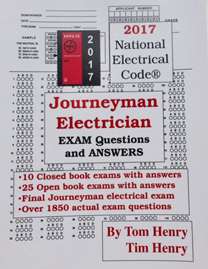 Journeyman Electrical Exam DVDs made by an electrician.Tom Henry has prepared over 28,000 electricians for their electrical exam since 1979. 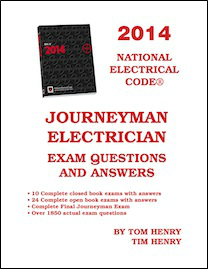 Now you can prepare for the Journeyman electrical exam in your own living room. Each presentation is approximately 75-90 minutes and also include worksheets. 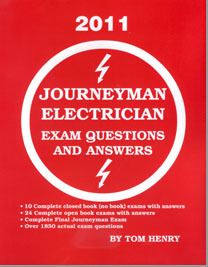 The Journeyman Electrical Exam Series is included in the Master Electrical Exam Series. Includes 9 DVDs with worksheets. Based on the 2008 National Electrical Code. Can also be used with the 2011 and 2014 National Electrical Code. The ampacity Tables were renumbered in the 2011 Code. This book is NOT included with the Journeyman Electrical Exam DVD Series. An ideal book to study the 2008 Code! Over 1800 exam questions with answers & Code References. An ideal book to study the 2011 Code! Over 1800 exam questions with answers & Code References. An ideal book to study the 2014 Code! Over 1800 exam questions with answers & Code References. An ideal book to study the 2017 Code! Over 1800 exam questions with answers & Code References.